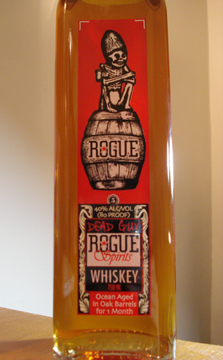 I’m a fan of Rogue’s line of beers, so when I stopped by Downtown a few weeks ago to stock up on some of my usuals, I was intrigued when I saw Rogue Dead Guy Whiskey. It makes perfect sense that successful microbreweries would want to expand into whiskey — same ingredients, same basic realm of interest — but I haven’t seen too many of these types of products on the shelves. Perhaps I’m just not noticing them or perhaps this country’s bizarre regulations that make microdistilleries a difficult enterprise are getting in the way (see the ADI site for more info on that). Regardless, I’m glad to see Rogue getting this new product all the way out here in the Northeast. It looks like they’re using an all-malt mash (same as their beer) and aged like bourbon. To the stats. If you’ve ever seen a bottle of Rogue Dead Guy ale, then you already have a decent picture of this bottle. The label text on the back isn’t noteworthy, but I like that they list ingredients all the way down to the specific type of malts used. It gives the impression of honesty and pride. The bottle is a rounded-edge square column and shows off the color nicely. Rogue Wiskey begins with a very sweet scent reminiscent of banana bread and a bit of cream and honey. On the back end there’s some harshness, which might indicate relative youth, but I haven’t been able to find a specific age statement for this bottle. Tasting it, Rogue starts up with that banana bread quality, but moves to an unsettling soapiness shortly after. Fortunately that fades into a nice lemongrassy, malt-driven bite down the side of your tongue. The finish is thin and dissipates quickly. I do enjoy a malt-based whiskey aged bourbon style, so this hits some strong points. In the end, though, I found Rogue a little on the thin side for my tastes. I was hoping for something bolder and more robust — perhaps something that could come with a little more age. It’s a decent whiskey, and I love what they’re doing as a company, but there are better options out there in this price rage. I apologize to my readers for the recent lull in my posting schedule. I spent ten days down in Austin then another ten recovering – in not much of a mood for liquor. The blog may have also experienced some down-time lately, hopefully that should be fixed now. This week, however, I have something a little different: a “Colorado whiskey” – namely Stranahan’s. Anyone who has read this blog before might have noticed that I like to cheer on whiskies that originate from outside the Kentucky/Tenessee region. I like to imagine that the further one gets from the heart of bourbon production, the more willing one is to experiment with production. While this is blatantly not true – with the wonderful experimentation going on in Kentucky and some traditional products coming from elsewhere – it’s at least an interesting draw into new ground for me. Stranahan’s is made like a bourbon, except with an all-barley mash instead of a corn-centric one, and aged a “minimum” of two years. Let’s see how it pans out. The large metallic silver top defines this bottle’s appearance. It may look like a shot glass and/or serving suggestion, but at this price point, I hope that’s not the case. Otherwise the steeply angled labeling is simple, with an emphasis on hand-marking. The background is faux aged and the descriptive paragraph very short. One appealing aspect is the “Comments” section of the label where “listening to the Pogues” is written in, a charming addition if it’s genuine. These guys might just be small enough for that to be real. To the nose Stranahan’s comes across with hot asphalt, watermelon, honey, and salty ocean wind. The latter two Scotch-like notes are probably a result of their common use of barley. The scent is smooth and without any significant alchohol character to it. Tasting it again draws likeness to Scotch. It opens with a big, bright lemony sensation that falls back into a dandelion bitterness that lingers for a bit before fading into a long, dry, warm finish that never really releases that first lemon aspect. I am impressed with Stranahan’s. If you like your sweet bourbons you won’t be too pleased here since the barley doesn’t have that kind of sugary character, but it is different from any other American whiskey I’ve had lately – in a good way.